OneRepublic is an American rock band from Colorado Springs, Colorado. Formed in 2002 by Ryan Tedder and Zach Filkins, the band achieved success on MySpace, becoming the most prominent un-signed act on the website. They signed onto Mosley Music Group in 2006, and released their debut album, Dreaming Out Loud in 2007. 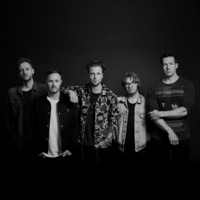 OneRepublic made radio history when with their first single, "Apologize" received the largest amount of airplay in history with 10,331 plays in one week, the record only being broken again by Bleeding Love, a song Tedder also co-wrote. The remix version, featured on Timbaland's album Shock Value was a smash hit internationally, reaching number-one in sixteen countries and gaining 10 million downloads (the largest number of digital downloads for any song to date) subsequently earning them a Grammy Award nomination. The band also achieved national success with their second single, "Stop and Stare". Dreaming Out Loud was certified gold in the United States, Austria, Australia and Canada. The band's second album, Waking Up, was released on November 17, 2009. The lead single from the album, "All the Right Moves" charted in the top ten in Ireland, New Zealand, Switzerland and in the top 20 on the Billboard Hot 100.